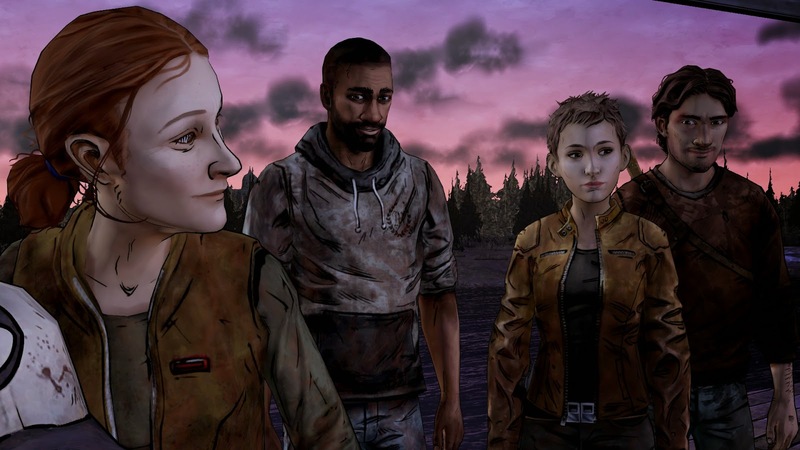 Just as I did with The Wolf Among Us, here's a final review for The Walking Dead Season Two that takes a look at how the season fared overall for each category. In the second season of The Walking Dead, you play the role of Clementine, a young girl who is separated from a couple accompanying her called Christa and Omid. It's then up to Clementine to fend for herself, alone in the wilderness, surrounded by hordes of zombies. Clementine eventually comes across another group taking refuge in a house but Clementine doesn't find it so easy to gain their trust. The game has a branching narrative so conversations will be slightly different based on your relationships with other characters or certain clues you notice. At the end of an episode, you're also able to review whether you sit with the majority or not when it comes to pivotal choices in the game (e.g. showing compassion to a character or not). What I like best about this season's finale though is that there are actual multiple endings to this one, not like the first season where the ending is pretty much the same no matter which choice you make. The gameplay stays pretty much the same throughout the entire series with little variation. Audio quality and voice acting quality remained the same throughout the season. Voice acting was great but to be expected from veteran voice actors with the only issue I had being the audio volume which was sometimes too loud or too soft. The game has a suitably atmospheric music soundtrack; while there are no memorable themes it is effective in setting the sombre, depressing mood to the game. Some themes from the first season of the game even gets some airtime in the final episode. Just like Season One, the ending you receive depends on the choices you make in the game, so there is some attraction there to replay the episode (and indeed, the whole game once it is released). Also like Season One, achievements are still very easy to acquire (i.e. proceed to a certain point in the story) and there's not enough variety to encourage multiple playthroughs. Just as it was in The Wolf Among Us, earlier episodes of the game tended to go for almost two hours with later episodes becoming shorter and shorter (usually being half an hour shorter). While I'm a firm believer of quality over quantity (some of my favourite games of all time are old point 'n' click adventure games that only take a few hours to complete), you still want to make sure you get your money's worth. Lets hope Telltale Games don't end up with episodes that are under an hour in duration for future games. The Walking Dead Season Two sticks to the same formula that made Season One so popular yet you now get to experience it through the eyes of a little girl called Clementine. As it was in the first season, Clementine discovers that sometimes it's not the zombies she should be afraid of but the surviving humans instead. 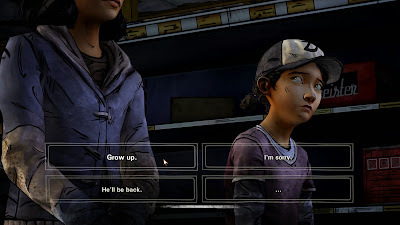 Each episode explores different ethical dilemmas and hardships with Clementine learning from each experience, culminating in a dramatic finale where she gets to finally choose who she trusts.